GRAFFITI ROGUES /// Freestyle graffiti and stencil art in a place where all urban art styles are encouraged. ROGUE DJS /// Drop your favourite beats, mix tracks and learn to be a superstar DJ. BEATBOX ROGUES /// Spit some ‘boots and cats’ into a loop pedal and layer a bassline with beatbox sessions. ROGUE WOMBLES /// Collect and recycle objects to build decorative art sculptures and trash instruments. ROGUE STICKERBOMBS /// Create your own stickers and go on rogue sticker tag missions. All new Rogues are welcome to participate whether they have experience or not. Part of the fun is learning while enjoying to make loud music and creating colourful and messy art in a safe environment. 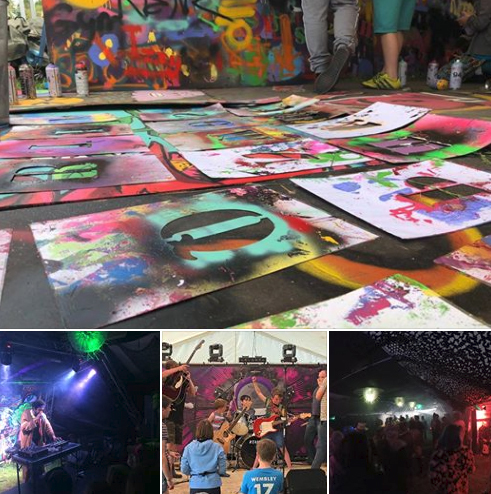 It’s three days jam packed full of live music, DJs, graffiti, beatboxing, Wombling, arts, sticker bombs, unicorns, mischief, mayhem and much more! Come and find us for a weekend full of Bearded Roguishness!